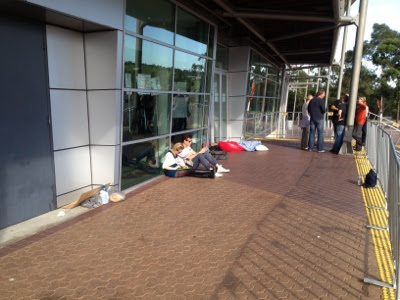 Today with a single GA ticket, and having missed out on priority entry so far in Sydney I decided to go all out, and line up as early as I could. After an hour's train ride this turned out to be 9am. Based on Brisbane's early doors I thought I could at least get in the top 50. An assumption that I should have learnt by now that was sure to be a mistake. If there is one thing clear on this tour, it's never underestimate a Springsteen fab. The guys currently head of the line arrived here at 9pm last night. They were joined by a few more around 10pm, and others have been adding to the line since the early hours. Right now, I'm at 71. With roll calls planned for 10am, 1pm and 3pm to check everyone is holding their position. 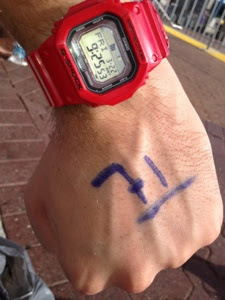 Which means if those ahead of me are missing could move closer to the front of the line. But seeing the dedication of these fans I'm not feeling all that lucky.